It's Spring Cleaning and Home Organization month on Curbly, and we're doing our best to make things manageable and easy so you can whip through the process and enjoy your clean home! 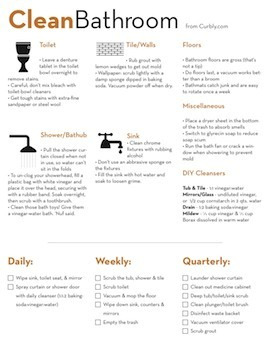 Last week, we shared a quick and easy kitchen cleaning cheat sheet and checklist, and we got great responses from our readers. So, this week, we're back with that other tough to keep up space: the bathroom. Sign up for our free, weekly newsletter (we won't spam you, and you'll get a link to the download after you sign up). Go to our newsletter signup page to get started. The print is small, I can't read it. Could it be done in a larger font? It won't let me zoom from my phone. Looking forward to receiving the emails! Send us an email at tips @ curbly.com, and we'll happily reply with the links.